Five authentic TOEFL iBT® tests in print and on DVD-ROM-- from ETS, the makers of the test! These five actual retired TOEFL iBT® test forms contain authentic reading, listening, speaking, and writing questions. Each form includes an Answer Key and complete audio scripts. The TOEFL® test is the most respected English-language proficiency exam accepted by colleges, universities, and agencies around the world. The accompanying DVD-ROM provides interactive computer-delivered versions of all five tests, plus separate audio tracks for all test listening sections for readers who are working with the print version. 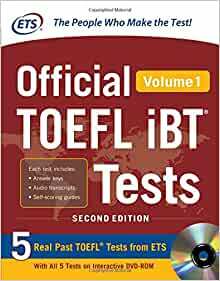 For even more practice, look out for McGraw-Hill Education's Official TOEFL iBT Tests, Volume 2, which contains five additional real past TOEFL tests. At Educational Testing Service (ETS; Princeton, NJ) we advance quality and equity in education for people worldwide by creating assessments based on rigorous research. ETS serves individuals, educational institutions, and government agencies by providing customized solutions for teacher certification, English language learning, and elementary, secondary, and postsecondary education, and by conducting education research, analysis, and policy studies. Founded as a non-profit in 1947, ETS develops, administers, and scores more than 50 million tests annually―including the TOEFL® and TOEIC® tests, the GRE® tests, and the Praxis® assessments―in more than 180 countries, at over 9,000 locations worldwide.